Cheapest Camera Removal service cost in Singapore. Fast Camera Removal Service for NS. Because we do it better, because we do it safer, because we do it with a smile! Looking for reliable Camera Removal Service which is in Singapore? Look no further because we are the best and cheapest place to remove your phone camera for NS. Also, our camera removal service is nett. Simply scroll down further to find all Camera Removal service costs. Camera removal service is done on the spot. The waiting time is 30 minutes. Additionally, there are 30 days warranty for all repairs. Camera Removal is a popular service in Singapore. It is common for most Singapore boys to remove camera for NS (National Service). In fact, most army camps in Singapore have red zones, which don’t allow camera smartphones. Having said that, the requirements of army camps are very different. For instance, some camps allow sandblasting or camera removal. Others allow cover up of the camera lens. Hence, check your camp’s guidelines carefully before you approach us for camera removal. Mister Mobile provides reliable camera removal service which adheres to the rules of army camps in NS. Furthermore, our prices are affordable. Camera removal service will remove or disable the cameras (back and front). The camera will be returned to you afterward. You can easily re-install them again in the future. Second, there is no need to pay twice to remove both cameras because we remove them at a one-time cost. Next, you can choose between camera removal, blurring of the camera lens (also known as sandblasting), or cover-up of the camera lens. Our camera removal service takes between 30 to 45 minutes to complete. After the repair, you can open the camera app to show that both the front and back cameras are disabled. 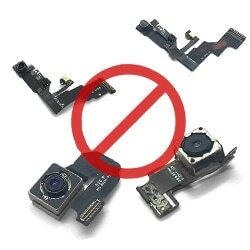 This camera removal process cannot be reversed until you dismantle the phone to fix back the cameras. We can also provide a letter stating that the camera has been removed. You want a fast service to remove your iPhone camera for NS. Yes, camera removal is reversible. In the future, simply come back to us to re-install the camera when you wish to. If your phone produces a blurry photo, first try to clean the lens with a clean cloth. Next, examine the surface of the lens for scratches as well. If it still produces a blurry image, your back camera may be faulty. At Mister Mobile, our replacement parts are as good as original. Hence, we don’t advertise our product as “Original” because only authorized service centers such as aLAB or Apple Store are allowed to advertise their product as “Original” arcording to consumer law. Yes, we can repair on the spot. Furthermore, there will be NO data loss 99% of the time during the repair process. Ever had unhappy phone camera removal service from shops in Singapore? Were there lots of trouble with dishonest providers? Drop by to get your Phone camera removal service. Pay after we have fixed your phone. We provide phone repair in Singapore, such as battery problems, charging, remove Phone camera for NS, Phone camera removal service. We also fix software, water damage, and motherboard problems. FAQ -How do I make a booking?